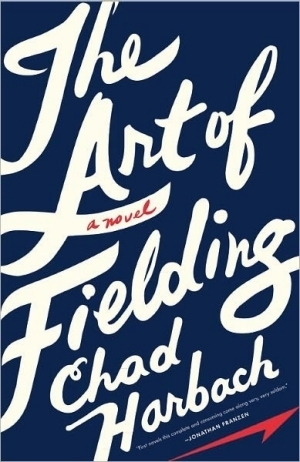 Chad Harbach’s debut novel The Art of Fielding was a good summer read—not too light, not too heavy. As a Wisconsin native, I was pleasantly surprised to find this story is set in a fictional small northeastern Wisconsin town Westish and its eponymous liberal arts college. Harbach, also from the land of cheese and beer, mentions fish fry, the Brewers, the Milwaukee airport, Schlitz, and so on throughout the book, giving me a nice little “home” buzz each time. I read John Irving’s A Prayer for Owen Meany earlier this summer and I was in disbelief when I learned that Harbach had never read it. Both books’ pivotal, plot-defining moments involve a baseball cracking a head and characters named Owen. Pure coincidence? Really? Harbach’s baseball writing is dynamic and well paced, if a bit predictable. It helps to be knowledgeable about baseball, but not required…. although I do believe a non-sports fan would lose interest in the book. The characters in The Art of Fielding are fleshed out and down to earth, even secondary players. I found the bond and breakdown between Henry and Schwartz relatable and the most interesting of the storylines. Owen was great—probably my favorite character along with Schwartz—but I had to suspend my disbelief a lot with him being on the baseball team. At a liberal arts school like Westish, Owen would no doubt be in the theatre department. Erudite college president Guert Affenlight is all charm and intellect on the surface, insecure lovesickness beneath. He and his daughter Pella were not so compelling for me, especially Pella. I wanted her to be stronger and more self-sufficient, considering her being touted as highly intelligent and gifted when she is introduced. Pella was just kind of vapid and weak—her whole identity revolving around men and their treatment of her. All except Owen are plagued with self-sabotage and spiral deeply into depression, substance abuse, and bleak situations. The plot moves along at a comfortable clip, and I found myself getting through this 500+ page book fairly quickly. Cliffhangers and short chapters keep you reading, although occasionally these techniques could be frustrating when dealing with an important plot point. I wasn’t thrilled with the finale—seemed a bit convenient and unbelievable, not exactly fitting with the rest of the story. While it is a long book (perhaps a touch too long), it left me with a bit of a feeling of emptiness. I’m not shocked by this feeling, with the book’s weighty theme of depression throughout. Many paragraphs were devoted to detailed <ahem> play-by-plays of a character’s ordinary, mundane non-actions or boring inner monologue about whether or not to do the dishes (for example). However, the descriptions of profound melancholy and hopelessness are very affecting and realistic. Besides depression, though, I thought the themes of sportsmanship, teamwork, losing momentum or confidence in yourself, being the underdog, and acceptance were great. I loved the Westish Harpooners baseball team as a whole. The Art of Fielding would probably make for a great film adaptation or TV miniseries. Read from July 30 to August 10, 2012. This entry was posted in books and tagged drama, fiction, friendship, midwest, sports by kristin @ my little heart melodies. Bookmark the permalink.